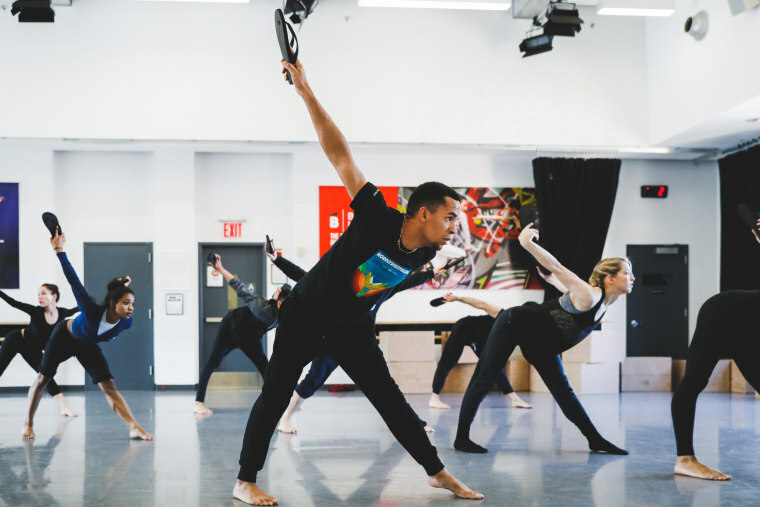 When Ballet Hispánico takes the stage this month at the Joyce Theater in New York City, audiences will experience new works from Asian-American choreographers — a first for the 50-year-old company and legendary Latino dance organization. Back in May 2017, Vilaro received an invitation from Royon to a showcase he put together in New York for Filipino choreographers. Royon, whose choreography career was still in its early stage then, said he didn’t expect Vilaro to show up to his “small-time” showing. What Royon didn’t know was that Vilaro was looking for Ballet Hispánico to represent Asian culture that was influenced by Spanish colonialism. Vilaro was impressed with what he saw and approached the choreographer to discuss creating a work that would draw on Spanish influence in the Philippines. “The discussion opened both of our minds about crossover opportunity,” Royon, 35, said. The result is “Homebound/Alaala,” ("alaala" means “to recollect” in Tagalog), a dance that draws on Royon’s youth in the Philippines, particularly the experience of growing up without his mother. Royon's mother had supported the family by working in Saudi Arabia until the family moved to the United States when he was 12. The dancing takes place around Balikbayan boxes, traditional care packages that migrant workers send home to their families in lieu of visits. The dancers move the boxes around the stage to frame various scenes that depict family interactions and romantic love. “They’re like building blocks of life that frame moments and memories,” Royon said. The shoes are unpacked from a Balikbayan box and are cleverly worked into the various scenes, such as when sibling characters fight over them. At the end, they’re placed in a line at the foot of the stage, as if left behind before embarking on a journey to a new world. He decided to feature the shoes in part because during rehearsals, he discovered that some of the dancers who grew up in Latin countries also wore them. “It was one of those little points of intersection that made us feel like we had a common, shared experience,” Royon said. For the second premiere, Vilaro was interested in exploring diaspora communities in Latin countries. He turned to Liang, 44, the director of BalletMet in Ohio, to create a work inspired by the Chinese community in Cuba. For most choreographers, being assigned such a specific theme for a commission was unusual. Liang was born in Taiwan to Chinese parents. The family moved to Marin County, California, when Liang was 5 and he has no personal connection to Cuba. The timing is not a coincidence. We need to help expand cultural understanding. He began researching the migration of Chinese workers to Cuba in the 1940s-50s and the Chinatown in Havana that still remains today. He was struck when he discovered the Cuban New Year’s traditions of walking around the neighborhood with a suitcase and throwing water out the front door. Both superstitions are believed to bring better luck in the new year. “It reminded me of all the little cultural things that can make you feel different, the way I often did in Marin Country, as the only Asian family in the neighborhood,” he said. He decided to make an abstract work, "El Viaje (The Journey)," that depicts a woman watching a tightly knit group that moves intricately as a unit. Liang imagines the opening of the piece as her first New Year’s in Cuba, viewing the rituals from the outside. In what he calls a “time lapse,” the end of the piece is a year later when she has adapted to local tradition. Though her movements at the end blend into the group’s collective heartbeat, Liang allows her to retain her individuality. Vilaro, who became Ballet Hispánico’s artistic director 10 years ago, was also influenced by the politics of the day when he decided to highlight cultural intersection and migration. Another reason why the timing was right, Vilaro added, is the greater visibility Latino choreographers enjoy today. In the 1980s when Vilaro danced with the company, he observed there weren’t many places outside of Ballet Hispánico that offered opportunities to Latino choreographers. During his time as artistic director, Vilaro has worked to cultivate more of those opportunities through both mainstage commissions and through Instituto Coreográfico, a forum Ballet Hispánico provides for works in progress. Now, there’s a crop of Latino choreographers working across the world’s major ballet companies, such as Annabelle Lopez Ochoa who has choreographed for Dutch National Ballet and Scottish Ballet, among others. Her work "Sombrerísimo," created for Ballet Hispánico in 2013, is also on the upcoming program at the Joyce. The broad success of Ochoa and others gives Vilaro the freedom to explore new directions for Ballet Hispánico. Follow NBC Latino on Facebook, Twitter and Instagram. Follow NBC Asian America on Facebook, Twitter, Instagram and Tumblr. CORRECTION (March 22, 2019, 12:40 p.m. ET): An earlier version of this article misstated the year Eduardo Vilaro and Bennyroyce Royon met. They met in May of 2017, not 2016.